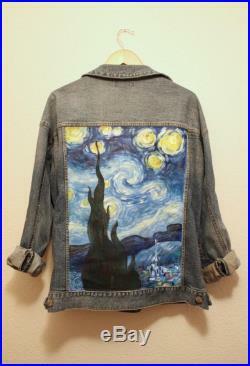 One of a kind hand-painted denim jacket starry night this is a hand-painted, one-of-a-kind jean jacket. Every single one is custom made, so if you want to change any details about the design, just message me. 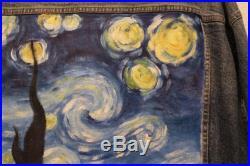 Since it is a custom item and each is made by hand, images may vary slightly from finished product. Custom orders can be made, feel free to message me. Sizes:eu s - xxlany sizes not listed here, as well as kid's sizes, can be requested any time. Upon request, i also custom-paint leather jackets. -i also take painting-commissions, so if you have any requirements just message me and we will arrange something. Everything displayed in this shop is copyrighted unless otherwise noted. No reproduction may be made of any of the artworks from this shop for commercial use for any reason without first receiving written permission from the artist.